StackAndTile is designed to help with the headache of navigating multiple online poker tables. The software places tables that require action in designated spots on a grid, while placing the tables that don’t need action in a separate stack until action is necessary. The program also assigns hotkeys to typical actions like calling, betting, and folding. The program is unique in its design, but makes the process of multi-tabling significantly easier. Installing StackAndTile is incredibly simple and can be accomplished by simply downloading the file off of the website. There is a 15-day free trial period where users can download it and evaluate the software. The entire download takes a few minutes from start to finish. Once downloaded, users are walked through a StackAndTile Grid Layout Wizard where you can set up the ideal size of your tables and your grid. It’s very simple and gives crystal clear instructions throughout the setup process. The Wizard first asks to size your table to your preferred width and height by dragging its corners to whatever size feels comfortable. Then, select F7 to lock in the size of the table. Once you’ve locked in the size, you can then select how many grid slots you wish to play with and use the “Visualize Grid” option to set where you want your slots to appear on your screen. Users will have multiple layouts they can select from, allowing them to customize their StackAndTile program to appear in a manner that will be the most optimal. Once you have your layout designed, select the online poker sites you wish to set up. This setup is also extremely simple and simply requires opening a table on a site and folding a single hand using F10 when it’s your action. Finally, table hotkeys allow players to set up hotkeys for actions such as stacking and tiling tables, calling, checking, betting, folding, and moving tables from slot to slot. You can also select if you’d like to have the hotkeys sent to an active table or only to a table under your mouse. The hotkeys aren’t necessary for operating the program, but certainly make it easier. Once you have the settings to your liking, it’s time to try the program out at the tables. It is highly recommended that you take a test drive at the play money tables to get used to the features and benefits of StackAndTile. The program will take a little time to adjust to, but the way it works makes perfect sense as you play. When action is folded to you at your first table, you have an option to play your hand or fold. If you fold, the table remains in the stack. But if you play the hand, the table is automatically moved into another area on your screen or a second slot on the grid that you set up. You can select as many slots as you want as well as where you want those tables to appear on your screen. 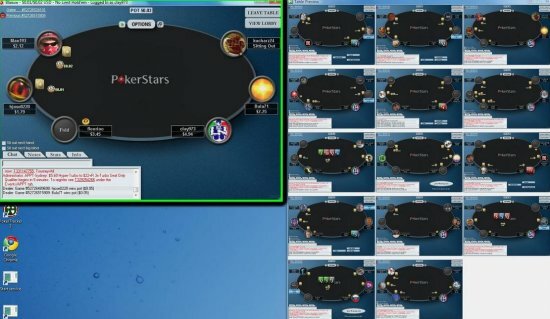 The more hands you play, the clearer it will be to see why the program makes multi-tabling so much easier. With each active table being spread out across the tiles on your grid, it becomes much simpler to identify the action in hands you’re involved in. These are all of the tables where you are going to need to make decisions on and you can watch the entire hand in the location of your choosing. At the same time, the tables you’re not involved in are simply moved out of the way and stacked on top of one another to eliminate the unneeded clutter that can easily be caused by multi-tabling. Easy identification of your active tables makes the entire process of multi-tabling simple. To purchase a license for StackAndTile, users must subscribe to a monthly payment of $17.95 to receive the Full Version, which permits access to all cash game and tournament buy-ins. Other plans are available for $8.95 per month for small-stakes cash games $0.25/$0.50 and under and tournaments under $15. A free version is available for micro-stakes $0.02/$0.05 cash games and $2 tournaments.